On 22nd May 2017 staff members from the Headquarters Brigade of Gurkhas visited 28 Squadron RAF Benson. 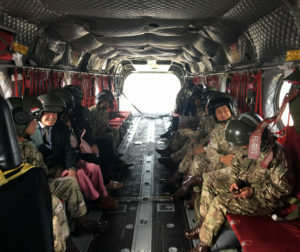 HQ Brigade of Gurkhas staff were collected from the sports field at the Royal Military Academy Sandhurst by a Chinook helicopter and its team. The pilot then took us on a flight across London along the Thames route, right over the London Eye, Shard and the O2 arena. The pilot then circled back across London and over to RAF Benson in Oxfordshire. The flight took approximately 45 mins and was a real please with great weather. With the rear door open on the Chinook the team got a fantastic view of the sights in London. Upon arrival at RAF Benson the team were met by the Squadron Leader and given a brief about the past and current role of the Squadron, their main taks being training on various Helicopter systems. Later on the trip the team were given a guided tour of the high tech training facilities and simulators. After the tour the HQ team were flown by Chinook directly back to Sandhurst the flight only taking 15 minutes. 28 Squadron’s Chinook helicopters have a demi-Pegasus painted onto the helicopter’s tail rotor pylon together with the Gurkha Flash of 48 Gurkha Infantry Brigade. The Kukri Flash commemorates 28 Squadron’s former forty year association with the Gurkhas which ended in 1994. The Brigade asked the Squadron to wear the Flash to remember its connection with the Gurkhas. This trip was a fantastic experience and we look forward to developing our relationship with the Squadron further in the future. But how can we match the experience they gave us!